Sign Up Forgotten your password? 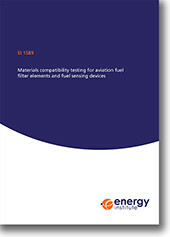 This publication provides minimum compatibility test requirements for inclusion as part of first article qualification testing for equipment intended for use in aviation fuelling. Such testing is intended to provide a means for manufacturers to demonstrate, under controlled laboratory conditions, the compatibility of their equipment with aviation fuels. This publication is specifically intended to apply to aviation fuel filter elements, quantitative electronic sensors for particulate matter and/or free water content measurement and qualitative electronic bulk water detectors. The requirements of this publication update those that were published previously in EI 1581, EI 1583, EI 1590, EI 1598 and EI 1599. Those titles will be amended (via addenda or as new editions) to reference EI 1589. Are you an EI Member? If yes, register/log in now to ensure you receive free access or discounts to EI publications. If you are not a Member, why not join today and receive all of the benefits of EI Membership? EI Members are entitled to a 25% discount on most EI publications.